has sewed but very little. Fed up with cooking, Evelina seems to have lost her temper in the kitchen. Since late summer she had boiled one pot or another of peaches, apples, barberries, and now quince. She had had enough, “tired and sick” of too much time stirring something on the stove. It’s unclear why she didn’t let the servant Catharine do the stirring and she do the sewing, but so it was. Besides putting up preserves, other preparations for winter were underway. Old Oliver noted that “we began to git out oure manure to day.”* This means that the stalls in the barn and the leavings in the barnyard were being mucked out and carted off. The manure was collected to go onto the fields and garden plots. It was either piled up for later or placed around immediately to help nourish the soil for the next growing season. 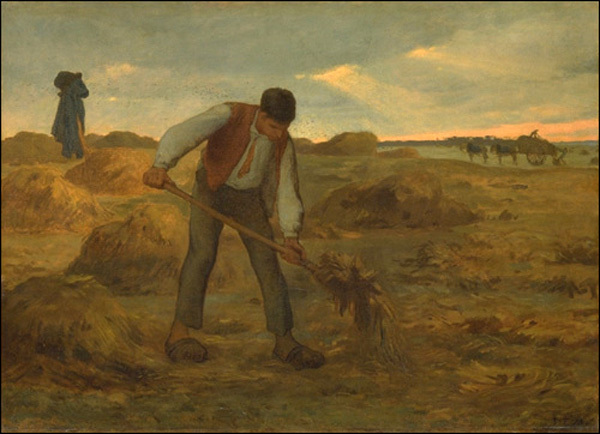 This was a regular fall task in agrarian societies all over the world; witness the illustration above of a mid-19th century French peasant spreading manure on a field. Even more important than these domestic efforts, however, was the news that the men had “started the enjoin”* at the shovel shop. A new manufacturing era had begun. No longer would water power be the only source of energy for the production of shovels.